Hyatt Regency Aruba offers magnificent ocean views while dining or relaxing. A sports club offering the finest equipment and instruction to partake of every imaginable water sport... windsurfing on world renowned waters...scuba diving among spectacular coral reefs and sunken Spanish galleons. Enjoy a multi-level pool with a 2 story water slide or refresh yourself in the resort's magnificent health and beauty spa. Visit Casino Copacabana with its dazzling entertainment and gambling tables reminiscent of the fabulous Cote D' Azur. The casino is opened from 12noon-4am. Built in traditional Caribbean style. The hotel offers 360 guestrooms & suites. The beach is 30 yards from the pool area. These newly remodeled spacious 380-sq.-ft. rooms offer a private step-out balcony, perfect for enjoying views of the tropical gardens and courtyard or ocean island views or ocean pool views. The rooms have either a KING GRAND bed or 2 QUEEN GRAND beds. Located on the beachfront of the resort serving indoors, with an expansive view of the open kitchen or outdoors. Great menu of cuisine from South America and the Caribbean. Excellent wines from South America. 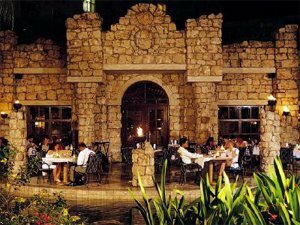 A cozy speciality Italian dinner restaurant located at the bottom of the stone staircase. Serving fresh pasta, pizza, veal and chicken from an open display kitchen. TCBY -the frozen yogurt and ice cream shop- and The Bakery Cafe also have a mini market with over 80 different package food snack items and 30 different bottled beverages to choose from.